The Prime Minister, Narendra Modi, today, visited Kanpur in Uttar Pradesh. The Prime Minister inaugurated the Lucknow Metro Rail project and laid the foundation stone of Agra Metro Rail project. He laid the foundation stone of Panki Thermal Power plant and unveiled plaques to mark the launch of various development projects at Niralanagar in Kanpur.Addressing the gathering, Prime Minister said that Kanpur is the birth place of many brave leaders who have contributed immensely for the country. He said the projects launched on the day, will transform the lives of people in Kanpur and Uttar Pradesh.The Prime Minister said that the State Government and Union Government has worked hard to improve the availability of electricity in Kanpur. In this context, he mentioned about the Panki Thermal power plant and how it will transform the power deficit situation in Kanpur and Uttar Pradesh. He added that under Saubhagya scheme, more than seventy six lakh free electricity connections have been provided in Uttar Pradesh.The Prime Minister mentioned about the initiatives taken by the Union Government to clean the River Ganga. He said that it was earlier thought to be impossible to clean the River Ganga, but now his government is making the impossible possible. Several actions were taken for the treatment of sewage water and stop drains from reaching the river, PM said.The Prime Minister said that the Defence Corridor coming up in Uttar Pradesh will greatly benefit the people of Kanpur. He said major infrastructure is being built in roadways, airways and railways, including the various metro projects started in the State. 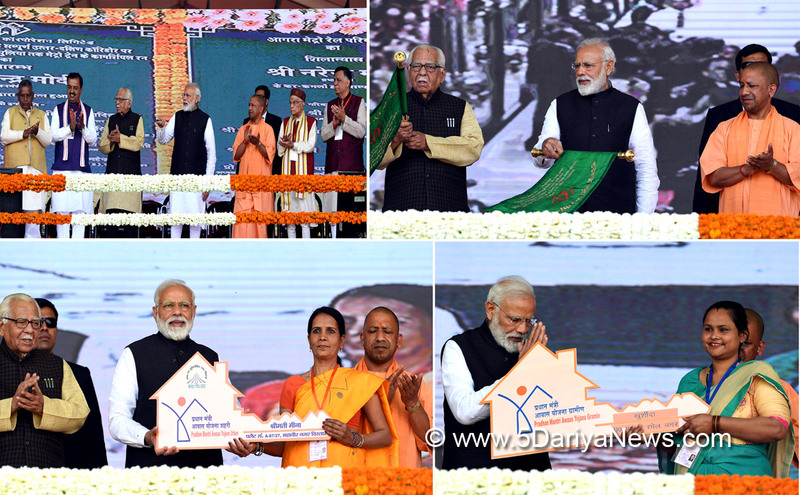 These projects will transform Uttar Pradesh, PM said.The Prime Minister reiterated that by 2022, every single family in the country will have a house. He added that under PM Awas Yojana, around 1.5 crore houses have been built in the country so far.The Prime Minister paid respects to the brave soldiers from Kanpur who lost their lives in Pulwama attack and Budgam crash. He said that the Union Government is taking strong action against terrorism.The Prime Minister said that it is important to maintain an atmosphere of unity in the country. He appreciated the quick action taken by the Uttar Pradesh Government against those who had attacked Kashmiris recently. He urged all the State Governments to take stern action against anyone who perpetrates such acts.